Aqua Alba, based on dark earthy notes of Labdanum and smoky Patchouli, evokes the soft mossy earth, to provide a woody base. A heart of heather, honeyed Gaiac Wood and Amber mingle with an elusive whisp of peat smoke, and the mysterious indefinable sweetness of Black Agarwood. Aqua Alba is the result of the celebration of the art of blending. In this case taking the distinctive flavours and aromas of Whiskey, and translating these aromatic notes into the components of an innovative, mysterious and intriguing fragrance. Angela Flanders Aqua Alba is available in 100 ml Eau de Toilette, £95. I met a friend for lunch on the East side of London and she mentioned there was a new fragrance shop I should check out. I walked by thinking it was Diptyque and realized it wasn’t. I walked in and it was Angela’s new boutique (apparently she only used to do a store on Sundays on a street market.) Angela wasn’t their but her assistant was absolutely amazing – showed me the whole line, sniffed all kinds of wonderful stuff and I walked out with a bottle of her gorgeously dark Fig Noire scent. The lady also mentioned another new niche store Bloom that was in walking distance. Yes – this is off topic from the new post – I just wanted to share that if you are interested in this line and happen to be visiting London – the lovely little boutique is worth a visit – its very close to Spitalfields market. Thanks! I tried a couple of them, but that was years ago. PBI She had a tiny shop in Columbia Road, where there is a famous market – mostly flowers – on Sundays. 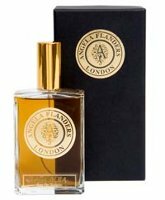 The Angela Flanders fragrances are REALLY good. I’m addicted to her “Topaz” at the moment, but fully intend to try this new one as soon as possible. Sorry, it was so long ago I can’t even remember what I tried. Though the names of her compositions tend to be fairly generic, most of them have twists of individuality that make them unforgettable. The name “Ambre Noir” for instance doesn’t immediately inspire great interest, but it’s like no other Ambre I know. It’s wonderful on a man! And “Xanadu” is a spicy incense, but incredibly dry and insistent.